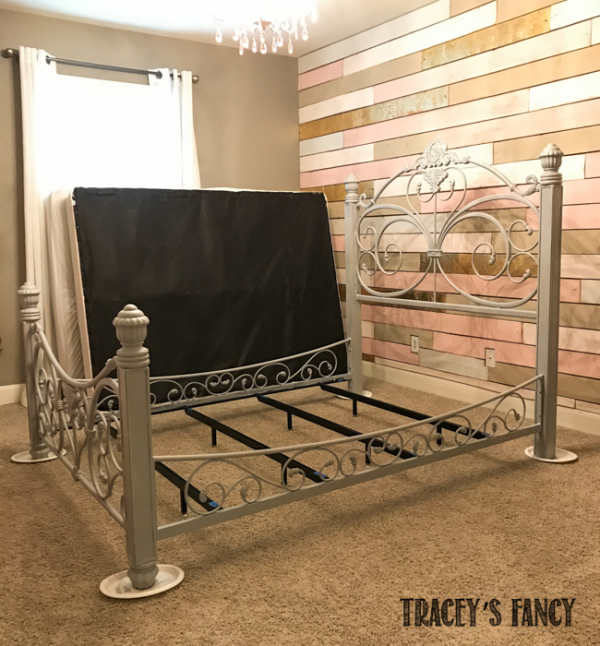 When I tackled my very first project in this same room three years ago….I never imagined I would be here again painting the queen size guest room bed for this same little girl! I’ve been involved in the crib-to-twin transition….and now the twin to queen! The bed is gorgeous….and was stunning in the guest room. 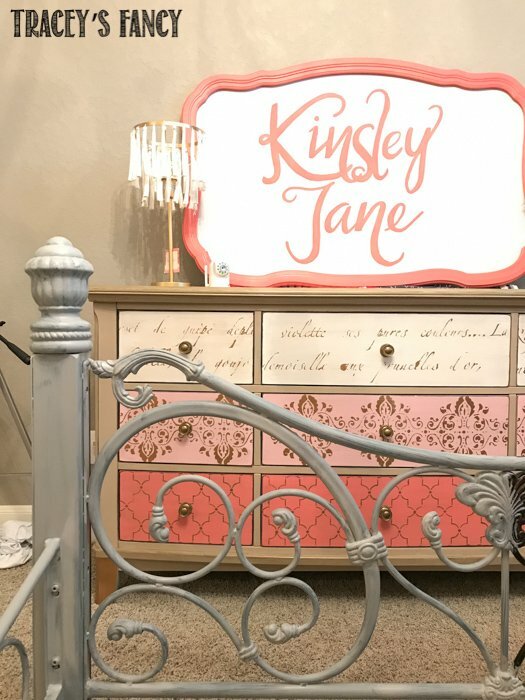 However, once they moved it into Kinsley’s light and bright room….it became dark and completely out of place! 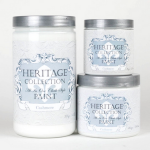 This is where I come in…..WITH my paint….because PAINT cures many design issues!!! 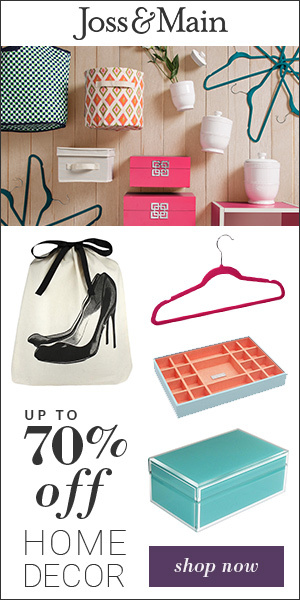 * This is not a sponsored post….but I have listed affiliate links for your shopping convenience. 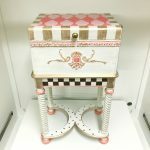 If you do purchase any of these items I could earn a small commission with no additional charge to you. In the photo above you notice the darkness against the soft colors of the wood wall (yes…that is one of my wood plank walls and you can find out more about those here). It competes with the wall design and is just overall harsh. Where the photo below shows the bed after just one coat of paint…and already it appears soft and more accepting of feature wall. 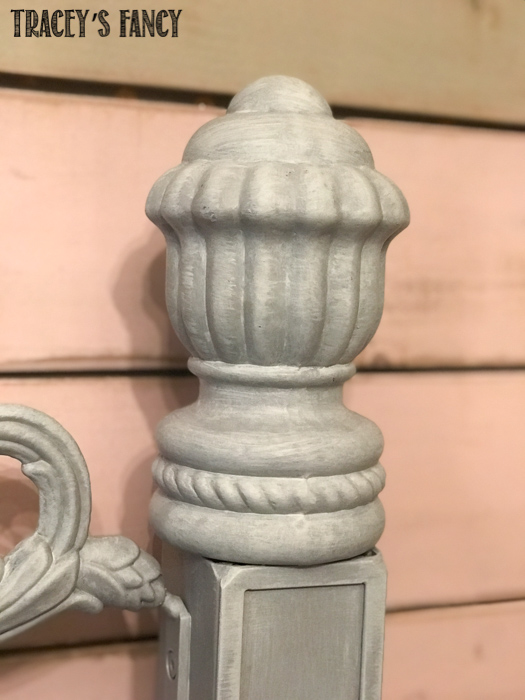 I painted two solid coats of Cobblestone paint and then did a light wash of Cashmere over the carved areas to bring out the details. You can see the white highlights in the photo below. 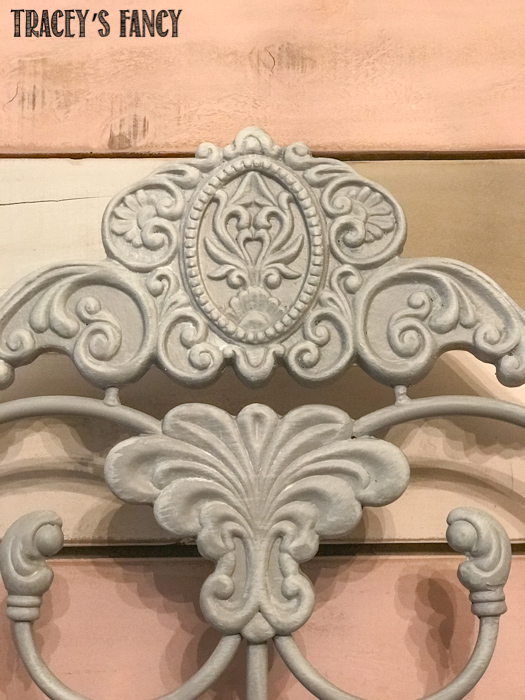 I really love the view below…..a “before and after” of the dark to gray against the backdrop of the stenciled dresser (you can see that project here). Again…the dark bed was just too daunting for this light and elegant room decor. The lighter bed against the dresser proves to be smooth and cohesive. Here is another good example of the “wash” of Cashmere to bring out the details. 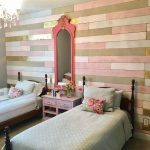 And I love the washed gray color against the soft blush pink of the rustic boards. Before I close…..I have a tip. 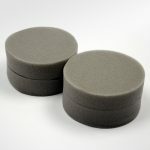 When painting post or spindles of any kind…..this True Applicator sponge works wonders. And using a stipple technique will give you the quickest and best coverage! Here is a little video showing how to do just that! 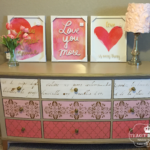 And lastly….here is a video showing multiple projects that I’ve completed in this very room! Full detailed blogs for each of the projects mentioned! Just click on the image!! 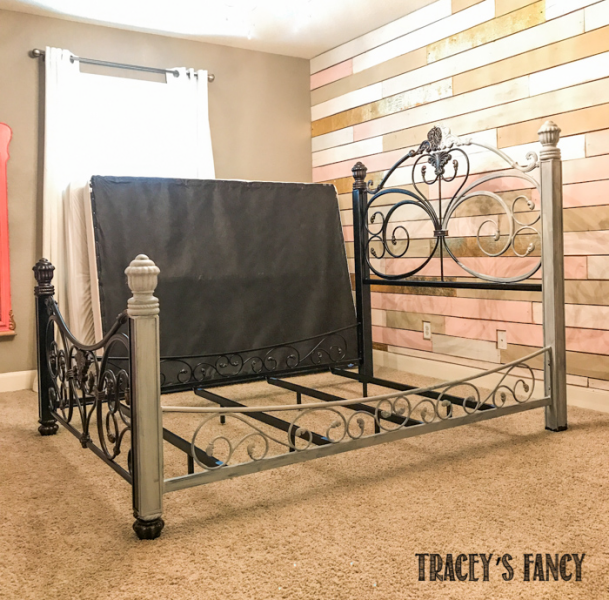 Below are the exact products that I used on this bed transformation! 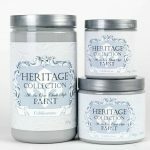 I choose this paint for projects that need extra durability! 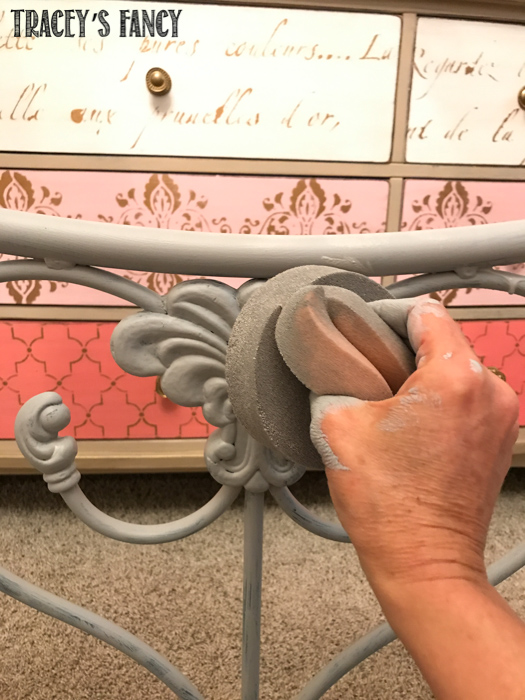 It goes on easily without prep or primer needed…..and requires NO sealer….which shortens the time involved….which is a huge bonus to me! If you have ideas for your own home….but are not sure of how to realize them…..give me a shout! I am here to offer direction and support in making your home fancy and fabulous….even from afar!!! Would you like to see more of my unique room designs, fancy furniture makeovers and insight into my design process?! Sign up to get my emails here. 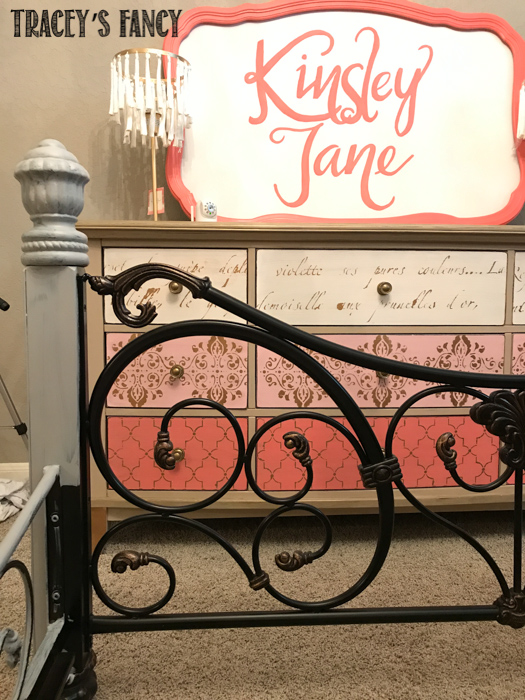 Please please please share my Painted Iron Bed pin and follow me on Pinterest!